Antony Van Leeuwenhoek (1632-1723), a Dutch Burgess, whose early use of lenses in examining cloth as a draper’s apprentice probably led to his interest in lens making. As a student of nature he was probably the first man to see blood corpuscles, protozoa, and bacteria. For these investigations, he designed and made a simple microscope. 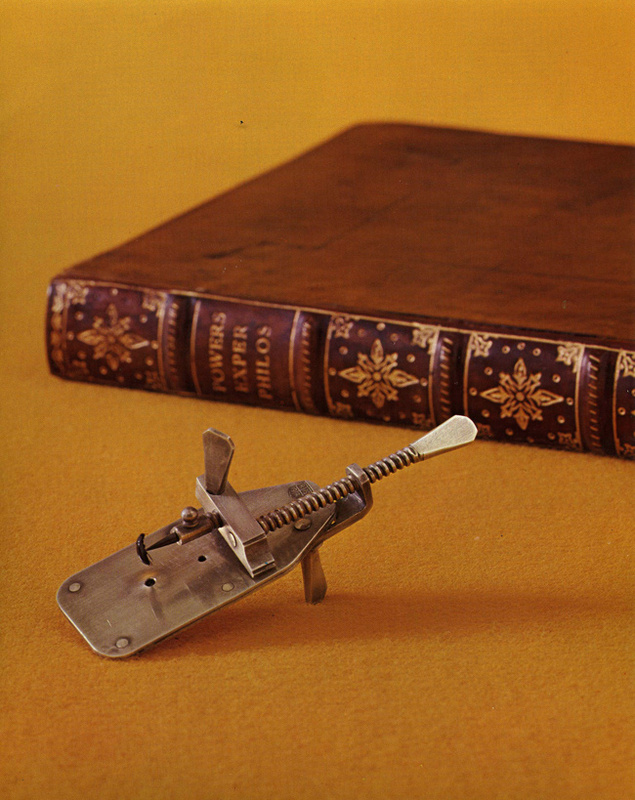 Leeuwenhoek made several hundred such microscopes. Of the nine originals extant today, the best has a magnification of 275x. These hand held instruments could reveal more detail than 18th century compound microscopes and were not really superceded in resolving power until the 1820′s. A reproduction of this antique instrument was made for this collection in the Royal Microscopical Society Collection at Oxford, England . The microscope is held up to the eye using the thumb screw. A pointed rod 1/4" long for mounting specimens is screwed into a 13/16" long metal block or stage. The simple lens is mounted between two thin sterling silver oblong plates 15/16" by 1 7/8" at their greatest dimensions. The simple biconvex lens is clamped in a concavity formed between the plates and secured by four equidistant rivets. A screw, 13/32" long, aligns the stage and object with the lens while a thumb screw on the eye side pivots the metal plates giving lateral motion. Focusing is achieved by a second thumb screw which passes through the stage at one end and presses against the plane of the oblong plates. Turning the knob of the object holder acts as a further focusing mechanism. The plexi-glass mount and case, provided with a wooden base with mirrored top surface, is 3 1/4" square and 6" tall. Overall microscope length, with object spike in position before the lens, is 3". The Replica Rara stamp is located at the base to the two oblong plates and to the right of the long focusing screw.